Margaret Teresa McSherry was born in Dartford in Kent on 13th June 1950, did almost all of her racing in England and never joined a Scottish club but was nevertheless a loyal and long term member of Scottish teams on the track and over the country. Her career was relatively long with Margaret appearing the Scottish ranking lists from 1966 right through to 1984. Although probably more of a speedster (she had Scottish rankings as low as 200 metres and she did not appear at anything further than One Mile until the early 70’s) she ran in the world cross-country international championship from its inception in 1967 through without a break to 1980. Representing Scotland in three Commonwealth Games, Margaret ran for Great Britain in 13 international fixtures and she was selected by the British selectors for the Olympic Games in Munich in 1972. A wonderful career by any standards. It is not intended to cover all her races in detail – to do so would require a biography rather than a profile – but to outline her career with some seasons looked at in detail. She first drew attention to herself as far as most Scots were concerned when she appeared in the Scottish ranking lists in 1966 over the 440 and 880 yards distances. In the 440 the 16-year-old clocked 58.94 and in the 880 yards 2:16.75. A year later and she ran 2:16.32 for the half-mile and 5:05.91 for the Mile. Margaret was also number three in the 800 metres with 2:08.1 and number six in the 400m where her best time was 57.6. These times at the end of the 1969 season were very encouraging for a 19 year old – especially with the Commonwealth Games coming to Edinburgh the following year. So how did she fare in 1970? It was a time when Margaret was also racing well over the country. She had first represented Scotland in the International event in 1967 when, like the 1500m in 1970, it was a new event on the women’s cross-country circuit. In that year she finished ninth t be first Scot home in the international at Barry in Wales. In 1968 she was thirteenth and in 1969 eighteenth to be again first Scot to finish. In 1970 however she had what was possibly her best run in the event to be sixth. Ahead of her were Doris Brown (USA), Rita Lincoln (who became Rita Ridley before the CG), Thelma Fynn (Canada), Barbara Banks (England) and Joan Page (England). Christine Haskett was two places and four seconds behind her with the third Scot being Sheena Fitzmaurice being one minute and twenty places further back. In 1971 she competed again in the cross-country championships as Margaret MacSherry (finishing 28th) but later in the year married Malcolm Coomber. The next few years also saw her times for all distances between 400 metres and the mile come down: between 1971 and 1973 the 400 metres came from 56.55 to 55.6, for 800m from 2:06.13 to 2:02.01, the 1500m from 4:37.85 to 4:26.43 and her mile pb dropped to 4:48.9. The big event in this period was of course the 1972 Olympic Games and 1972 was a good year in every sense for her. She set her best ever 400m of 55.3 that season and running in many high level meetings, including several GB internationals. Missing the SWAAA Championships, Margaret competed in the WAAA 800m where she finished third. The results for that year were more than good enough to see her selected for the Munich Olympic Games. Here she ran 2:03.0 to be sixth in her Heat and she failed to qualify but Rosemary Stirling, another Anglo-Scot did 2:03.6 to be third in her Heat and get through to the next round where she clocked 2:02.4, which in turn saw her into the Final where she ran 2:02.0. Athletics can be quite cruel at times – the Heat draw did not help Margaret’s cause at all. At the end of the 1972 season she was ranked number three in the 400m with her 55.3m, number two in the 800m with 2:03.0, number four in the 1500m with 4:31.5 and number three at the mile with 4:55.5 run indoors. In 1973 Margaret was ranked for the first time at 3000m – and ranked in second place. Another very good year and it is maybe surprising that she had not been ranked at that distance before given her undoubted ability and strength over the country. She started the year in the Scottish championships in Edinburgh on 10th February where she had to give best to Christine Haskett. “The annual ding-dong battle for the Scottish women’s cross-country title maintained its pattern on Saturday in Edinburgh when Christine Haskett (Dundee Hawkhill) wrested the Mary Semple Trophy from Margaret Coomber. These two have dominated the championship for the last four years. 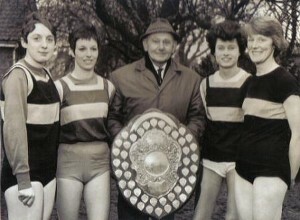 After having been runner-up in 1969, Mrs Coomber, competing for Cambridge Harriers, won in 1970 and last year; the title in the intervening years went to Miss Haskett. And on Saturday at Paties Road Playing Fields, Colinton, the Dundee girl justified the trip from Stretford where she is studying by routing the others for a 90 yard victory. Miss Coomber and Ann Barrass, another Anglo from Aldershot, stayed with Miss Haskett for the first mile or so, but then were unable to contain the sustained surge of the Dundee runner who covered the 3.75 miles in 22:53.” In the English national championships in Blackpool on 24th February, Margaret was tenth and a member of the winning Cambridge team while Christine had to drop out. Selected for the international she was again first Scot with a nineteenth place in the 4000m race at the championships at Waregem in Belgium on 17th March with Christine Haskett in twenty seventh. In the track season, Margaret made a rare appearance on a Scottish track when she finished first in the 800m at the British Games at Meadowbank on 18th June. Running a time of 2:06.9 she was three tenths of a second ahead of Sheila Carey and four tenths in front of Pam Cropper to be one of only two Scots women to take gold, the other being Myra Nimmo in the long jump. Les Piggot (100) and Norman Morrison (two miles) were the only two Scots men to win at the meeting. The following week at Drachten in Holland she won the 800m for Great Britain against the Netherlands and Czechoslovakia in 2:06.9 with Sheila Carey second only four tenths behind in second. Although she did not appear in the WAAA medallists list, Margaret was regarded as a safe bet for the Commonwealth Games team for 1974 in New Zealand along with such as Myra Nimmo, Liz Sutherland, Meg Ritchie, Rosemary Payne and Helen Golden. At the end of the season her bests for the various distances – ranking positions in brackets – were 55.6 seconds (6th), 2:02.0 (1st), 4:26.4 (3rd), 4:48.9 and 9:57.8 (2nd). She was as expected picked in the team to go to the Games. In the 800 metres she was fifth in the first Heat in 2:05.94 and failed to qualify for the next round and in the 4 x 400m relay, the team was fourth in the Final. After the success of the 1970 Games (from a Scottish national perspective) 1974 was a big come-down. It is possible to point out that it was a very difficult Games to time, given the European seasonal pattern for January in Christchurch. The international cross-country had been held in mid-March and the domestic track season had been a long one. Add in the fact that there were no permanent indoor athletics facilities at all in Britain and there are contributory factors for the relative failure of the team that year. 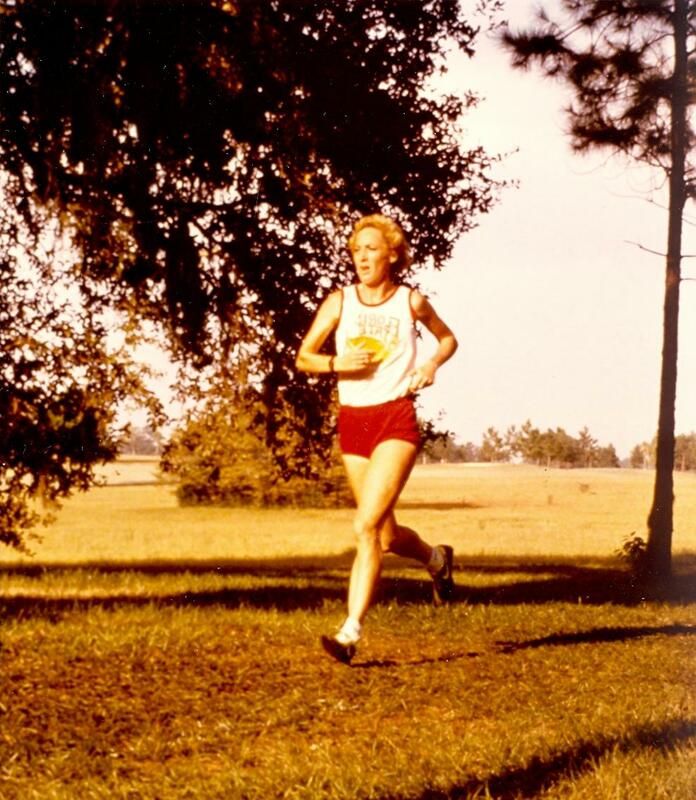 The following year, 1975, she finished third in the SWCCU Championships behind Christine Haskett and Ann Barrass to be selected for the international championships. In Rabat, Morocco, Mary Stewart was first Scot in eighth place, Christine Price was next for the country in 23rd with Margaret third counting runner in 39th. On the track her first biggish win was on 31st May at Crystal Palace when when won the 800m in 2:06, but the summer was spent as before with fast racing in England and high ranking positions in the Scottish Lists. There was no fast 3000m this year, instead the range was from 200m to 1500m : 200m: 25.3 (13th), 400m: 55.87 (5th), 800m: 2:04.59 (2nd); 1500m: 4:50.10 (4th). 1976 was an Olympic year so Margaret had to be going for it and sure enough her times for 800m and 1500m were quicker than in 1974. She started the year with the cross-country championships. In the Scottish Championships on 7th February she finished third, behind Christine Haskett and Moira O’Boyle and, since the first five finishers were automatically selected, progressed to yet another International championship. In the championship, she could do no better than 54th in a race that was growing in size every year with new countries entering teams. Scotland’s runners were Mary Stewart 9th, Christine Haskett 23rd, Moira O’Boyle 42nd, Margaret Coomber 54th, Ann Parker 60th and Mary Chambers 61st. Margaret’s best performances in summer 1976 were 200m: 26.1 w; 400m: 56.0 (1st in rankings); 600m: 1:30.5; 800m: 2:03.9 (3rd); and 1500m: 4:19.23 (2nd). Unfortunately none of these, good as they were, was good enough for a place in the Olympics team and her next opportunity to race at a major Games was to be the 1978 Commonwealth Games in Edmonton, Canada. 1977 was to be a staging post on the way there. Ana a clear statement that Margaret Coomber was still in business it was too! The top three Scottish times over 1500m, six of the top 15 and over 6 seconds clear of the next fastest (Judith Shepherd). She was also fifth quickest over 800m, had a 2:43.0 1000m and was second fastest over 3000m with 9:50.2 where Judith Shepherd had nine of the top ten times including the top seven and a season’s best of 9:20.0. She started the year as was usual for her with cross-country running and finished second in the Scottish championships to Christine Haskett and then headed for the International championships where she was first Scot but down in 52nd place in 19:02 with Christine Haskett back in 61st (19:17). With Judith Shepherd in 65th and Gillian Hutcheson 86th, the team finished a lowly 16th. On to the track season in 1977 and it was one in which Margaret reserved all her best performances for the second half of the season. Championships first. In the Scottish Championships at Meadowbank on 25th June, she won the 1500m in 4:27.2 from Judith Shepherd (Glasgow) in 4:31.2. Shepherd also won the 3000m in 9:39.2 from Christine Haskett who ran 9:56.3. She ran in the Sunsilk WAAA championships on 19th/20th August where she qualified for the final but was not among the medals. Her performances for the summer are summarised in the following table, fastest times at 1500m first. As the season was drawing to a close the international fixture between Scotland and Norway on was held on 3rd September where Margaret was third in the 1500m in 4:31.3. 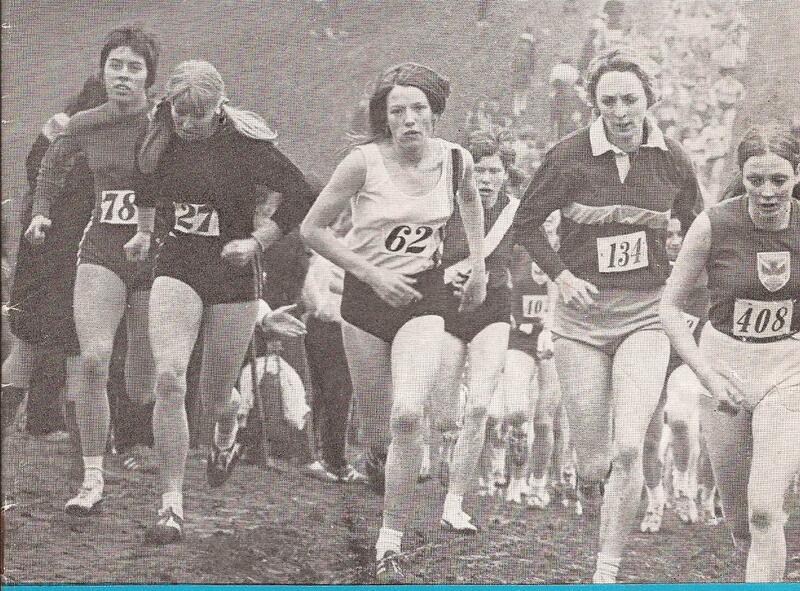 1978 began with the cross-country season and Margaret was out in the Scottish championships again but the main rival was not Christine Haskett this time but Judith Shepherd. The ‘Glasgow Herald’ report commented: Miss Shepherd, aged 18, had the satisfaction of winning the senior title at her first attempt. Margaret Coomber and Kerry Robinson, another 18 year old, gave her close attention most of the way but Judith broke clear half a mile from the finish and eventually won by five seconds from Mrs Coomber, herself a former champion.” And it was on to her twelfth consecutive world cross-country championships. Held this time in Glasgow on 25th March on a miserable wet afternoon in Bellahouston Park and it was not a good time for Margaret Coomber. who was second Scot to finish (Judith Shepherd was first in 22nd) in 69th place of 99 starters with the Scots team again 16th. Fiona McQueen in 79th and Janet Higgins in 87th were the other counting runners. Because of the Edmonton Games the SAAA/SWAAA Championships were held earlier than usual – on 3rd June – but as the ‘Glasgow Herald’ said on the following Monday, they posed some interesting problems for the selectors, one in the women’s 1500m. “Margaret Coomber, a veteran of two Commonwealth Games, pushes Christine McMeekin into third place in the 1500 metres in a native record time of 4:20.4 after Christine’s heat time of 4:21.8 on Friday night. Will both of them be selected?” Well both of them were selected and both of them qualified for the final. The final was held on 12th August with 12 runners and Margaret was 12th in 4:26:28. She had run faster seven times that year. Christine (McMeekin) Whittingham was 4th in a time of 4:12:43 – 4 seconds faster than her best up to that point. Margaret at 28 years of age had run in her third Commonwealth Games and run faster than ever over 1500m. Christine McMeekin was only her most recent rival – Christine Haskett had been a serious opponent for many years over the country and on the track, and in the previous year Judith Shepherd had provided her with a genuine challenge on the track and country. Margaret was still not finished with the Scottish track or cross-country scene yet. In the SWCCU Championships in Rosyth, there was no Margaret Coomber and the championship was won by Judith Shepherd from Kerry Robinson. Selected for the World Championships, Margaret was the third Scot to finish behind Judith Shepherd (44th) and Kerry Robinson (67th), in 82nd place of 100 starters. Back on the track, she was ranked in four events again – and for the second time was in the 3000m ratings. The times and rankings were: 400m: 58.0 (19th); 800m: 2:10.1 (7th); 1500m: 4:23.08 (5th); 3000m: 9:53.0 (4th). Competitively, in the SWAAA Championships on 16th June Margaret won the 1500m from Fiona McQueen (Glasgow) in 4:27. Fiona was one a very good group of young athletes from Glasgow being coached by former Scottish cross-country internationalist and Victoria Park AAC runner Ronnie Kane. His small squad had great spirit and included Fiona McQueen, Judith Shepherd, Lynne McDougall and Janet Higgins. When he died rather prematurely the group split with athletes going to college in America, to France as well as to other coaches within Scotland. It was a real loss when he died. Margaret ran in the international cross-country championship again in 1980 making it fourteen in a row since her debut in 1967 and although she finished 88th, she was the last scoring runner for the Scottish team and kept her record of being a counter in every one of the fourteen. 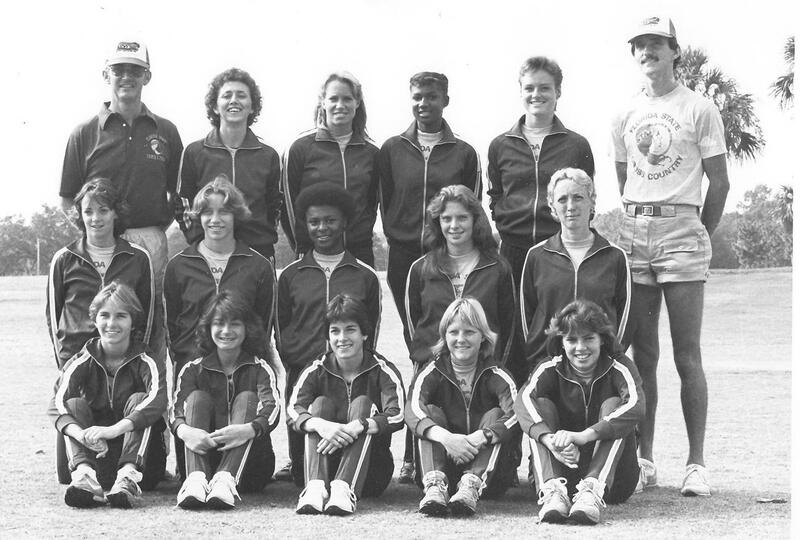 Florida State women’s team, 1981: Margaret is on the right of the centre row. Track races were listed separately and are as noted below. Immensely impressive but note that she was often required to compete twice in one meet and some of the ‘doubles’ were difficult – eg 24th April’s 800m/3000m double. Starting with 1981. When looking at the times bear in mind that the indoor tracks varied in distance and con figuration, the effect of doubling up in events (sometimes quite close together on the programme) and the imperative of getting high places for the University as opposed to going for a good time. Margaret’s performances kept her well up in all the national ranking lists back home but there were to be no more Games appearances for this excellent athlete who had run so well in Scottish and British championships, and who had represented both Scotland and Great Britain with distinction over many years at the top of the sport in this country.